EXCLUSIVE! Fast Disk Upgrades and Replacements — quickly clone a single disk or hardware RAID array to another for increased speed, increased capacity, or to replace a failed disk or array. Complete Disk Image Backups — quickly create, maintain, and restore complete disk image file backups that can be stored just about anywhere, including network attached storage devices and drives containing other data. Exclusive SmartClone™ Technology — dramatically reduces the time required to update, restore, and re-image Windows systems by safely eliminating the redundant transfer of data during the imaging process. EXCLUSIVE! Rapid Recovery Backups — create and maintain a bootable backup replacement disk for a system and use it as an immediate and permanent replacement for a failed disk. EXCLUSIVE! Quick System Restores and Re-imaging — create and maintain a disk image file backup that can be restored to a new disk or used to quickly re-image a Windows system disk. EXCLUSIVE! Simple Disk Image Deployment — use in combination with Microsoft's Sysprep utility to greatly simplify the process of manually replicating a hard disk image to a new computer system. EXCLUSIVE! Unparalleled Safety and Dependability — exclusive AccuClone™ and Automatic Copy Verification technologies bring dependability to a new level by automatically verifying the integrity of the disk image during the disk cloning and imaging processes. EXCLUSIVE! Convenient and Easy to Use — run directly from a USB flash drive or CD without installing any software or making any modifications to the system on which it is used. EXCLUSIVE! 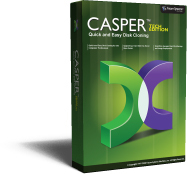 Economically Licensed for Technicians — licensed per technician rather than per computer so a single technician can use Casper Tech Edition on multiple computers.